Introduction: Research has proved the analgesic properties of nicotine1 and experimental studies have shown that acute exposure to systemic nicotine has anti-nociceptive effects in rodents2, which could make smoking more rewarding and physical dependence3. However epidemiologic evidence has demonstrated that the prevalence of tobacco use is nearly 2-folds higher among patients with chronic pain4; and has also revealed that smoking is associated with an increased incidence and severity of several chronic pain conditions including low back pain, diabetic neuropathic and fibromyalgia5. The purpose of this study is to assess the long-term effects of chronic nicotine exposure on induced neuropathic pain on mechanical and thermal sensitivities. Methods: IRB approval was obtained, and IACUC standards were followed. 4-week old male Sprague-Dawley rats were used. Animals were divided into two groups: a nicotine treatment group (NIC) and control group (CTR). In NIC group, animals were provided an oral self-administered sweetened (3% sucrose) nicotine solution as drinking water, dosed at 10 mg/kg/day for six weeks. Using an immunochromatographic assay, nicotine levels were monitored by measuring urine cotinine (a long-lived metabolite of nicotine). Results higher than 1000 ng/ml were considered similar to levels noted in smoking humans. In CTR group, rats received sweetened (3% sucrose) drinking water. On week seven both groups were treated with the chronic constriction injury (CCI) of the sciatic nerve to produce a neuropathic pain model in the left side. Mechanical and thermal tests were performed to determine pain sensitivities on both hind paws, twice a week in the six weeks of treatment and one week after CCI. 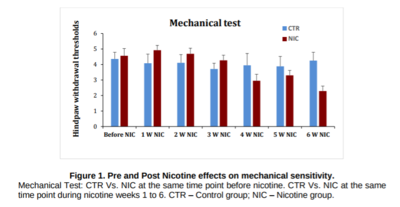 Results: Mechanical thresholds increased in the NIC rats during the first 2 weeks compared with the CTR group. 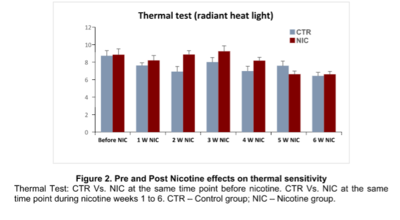 From week 3 onward, mechanical threshold of the NIC-treated rats progressively decreased compared with the CTR group, with the lowest mechanical threshold shown in week 6 (Figure 1). 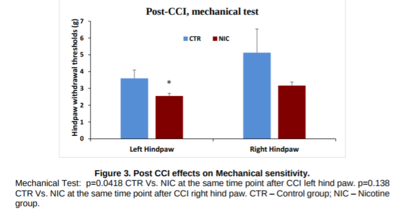 Hind paw withdrawal latencies were greater in the NIC group compared with the CTR group over weeks 1 to 4, with an increased peak in week 3; from week 4 onward hind paw withdrawal latencies continually decreased (Figure 2). 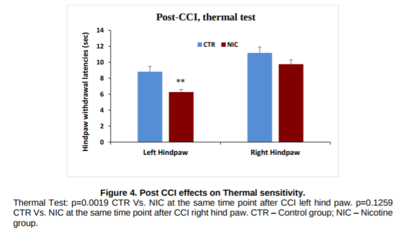 After CCI, the NIC group developed lower thresholds in the mechanical test (p=0.0418) (Figure 3) and shorter latencies in the thermal test (p=0.0019) (Figure 4) on the left hind paw, compared to those of CTR group. Conclusions: This study supports the concept that acute nicotine exposure has analgesic effects; however, under chronic nicotine exposure, animals demonstrated reduced hind paw withdrawal threshold and latencies (hyperalgesia). Also, after induced neuropathic pain, these animals revealed a greater reduction in thresholds in both the mechanical and thermal tests. The effect of chronic nicotine exposure contributes to the development of increased hyperalgesia which is similar to the phenomenon seen in chronic human smokers who have greater pain intensity, and also may contribute to the pathogenesis of chronic pain.